Hi All!Am very glad to release this month decoupage papers.This month papers are so lovely that anyone will fall in love with it for sure!So without any wait will reveal the papers. 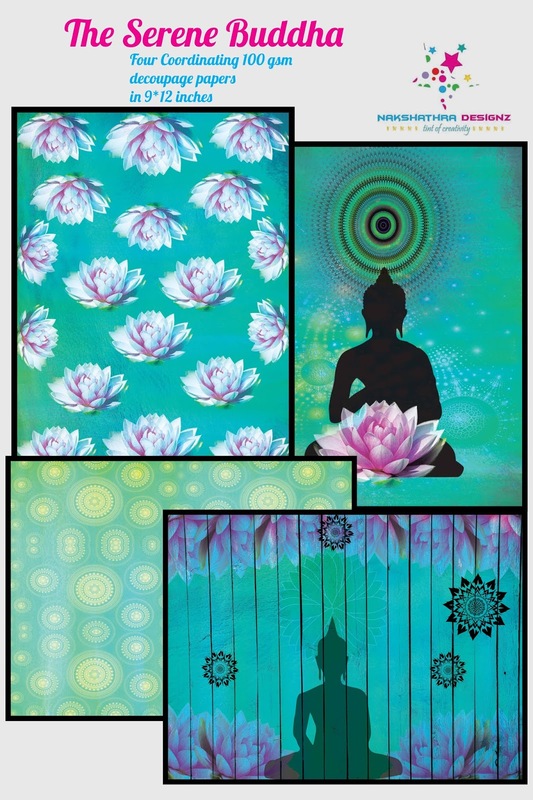 The first paper release for this month is "The Serene Buddha".This paper is so lovely that the color choice everything is so serene.You all will totally love this paper .This set comes as 4 unique designs of 100 gsm decoupage paper in 9*12 inches. The second and last set for this month is "Denim Love".We all love denim textures that can add beauty to any projects without a doubt.It comes as 2 coordinating designs of decoupage paper in 9*12 inches. We have our Design team call too!Just mail us your creative decoupage and scrapbooking projects to nakshathradesignz@gmail.com before July 31st 2018!